With the individual permission to edit the properties of individual object instances, you permit the changing of values that are also stored physically in the database for each instance, such as the name of the instance or address or contact data for an instance of the user object. Click here for more information. 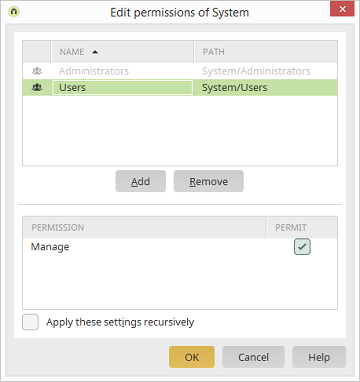 With this setting, the Manage permission will be provided to every user object which is subordinate to the to current object. The same applies if the permission is withdrawn.